All my life I have been interested in building. When I was little I used cardboard, paper, tape, Legos, wood, metal, and fabric to create anything I wanted. Really, I love using anything I can to make something I haven’t made before. Other than being a self-proclaimed engineer, I loved BMX- more specifically the bicycle itself. I wanted to build one. As a kid I didn’t really think I’d spend the next 30 years day dreaming about bike building; but I gained all the necessary skills to do the job. I most definitely never thought the bike I would build would lead me to start my own bike shop. At the Pennsylvania Academy of Fine Arts I began honing in on my skills while studying in their sculpture department. To survive as a steel sculptor, I also worked in the auto restoration business building hot rods. My second career was working as a painter and builder in the entertainment industry. 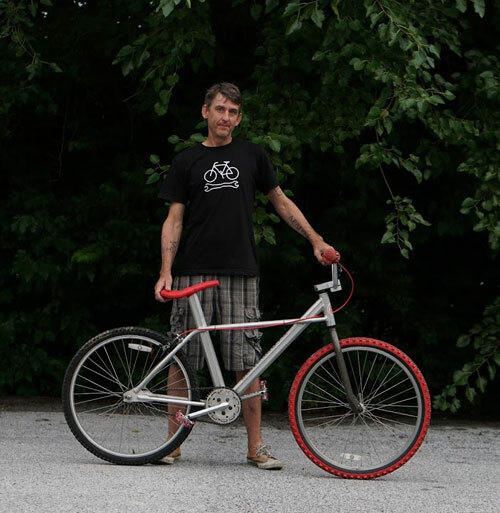 At this point, I was 40 years old, and I realized I had all the skills and tools to build a bicycle at my disposal. Taking design elements and geometry from some of the most unique names in 80’s BMX (SE Racing, Torker, and Haro) to create a life size drawing was the first step. After a few dozen renderings, a final blue print was made. For the sake of weight and rigidity I chose aluminum (6061 T3) as my building material. 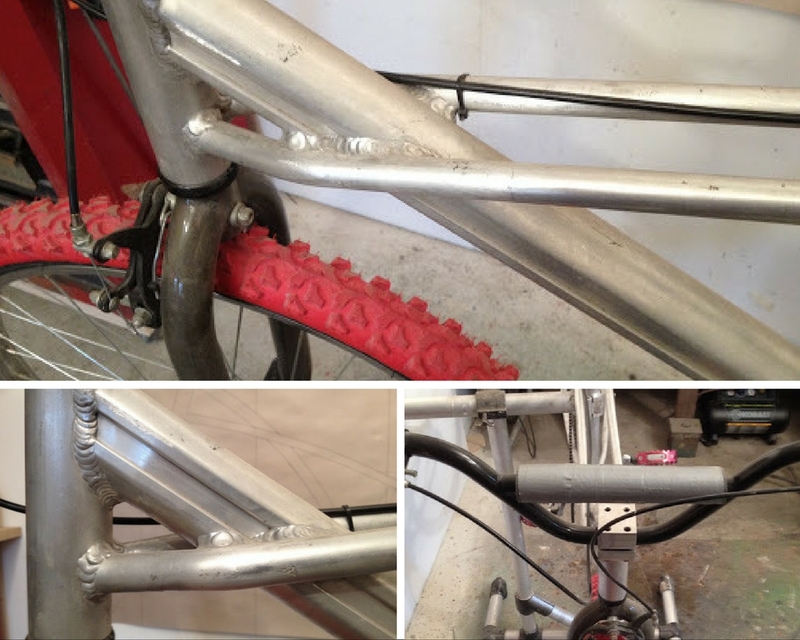 Most bicycle frames consist of a head tube, a bottom bracket shell, a top tube, a down tube, a seat tube, 2 seat stays, 2 chain stays, and 2 drop outs. Starting with the bottom bracket shell (2” American to keep it old school and easy) I fabricated each of the 10 parts, having them CNC’ed, coped, bent, milled, or drilled as needed. Next I placed the pieces into a three dimensional steel jig that I was simultaneously building. After the frame was welded and removed from the jig (due to some poor planning on my part the jig had to be cut into about a hundred pieces to remove the frame) it was outfitted with only the raddest of old school parts, including: SE Landing Gear forks, Redline Big Block cranks, and CW cruiser bars. My bicycle is probably the coolest thing I’ve ever built. I say this because it's a great combination of things I love; making things, bicycling, and thinking about something so hard that a fantasy becomes a reality. It also played a big role in the creation of my third career as owner of one of Lancaster County's coolest bike shops. In the future I hope that Barebones is not only a bicycle shop but a handmade bicycle, as well. Love your bike© 2019 Barebones Bicycle, All Rights Reserved.